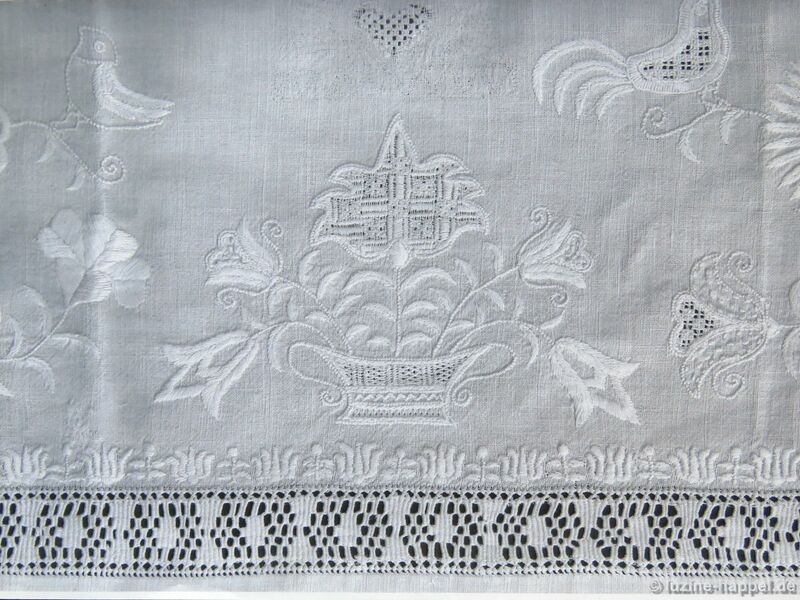 Embroidering samplers was and is popular and common. 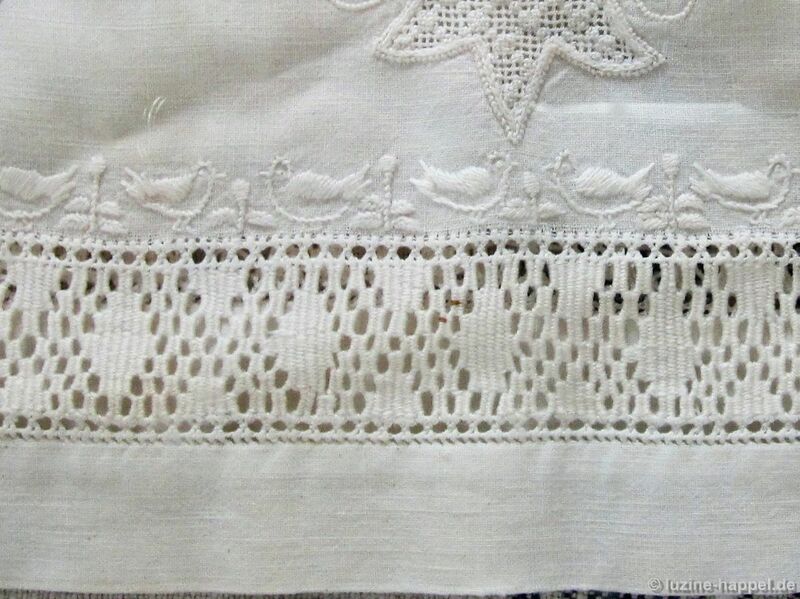 Schwalm women also created samplers – samplers with very different appearances. 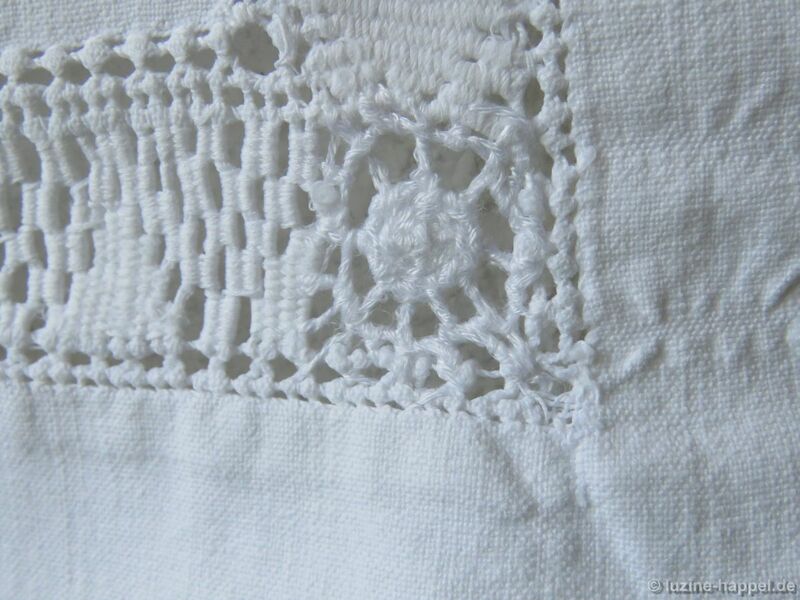 I will present some of them in different articles; the first deals with sampler chloths. 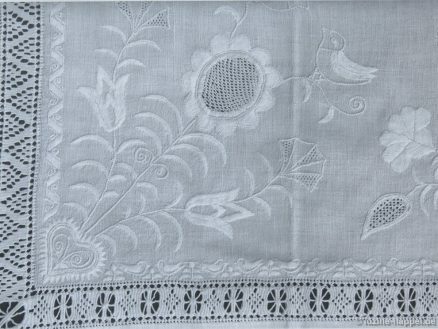 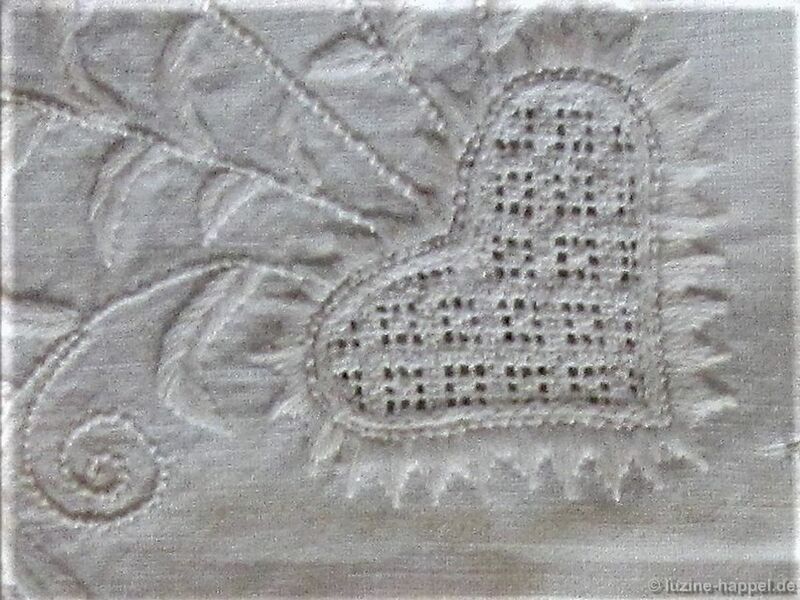 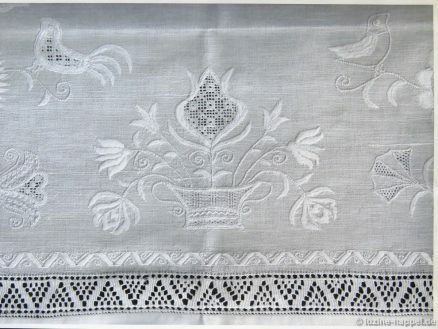 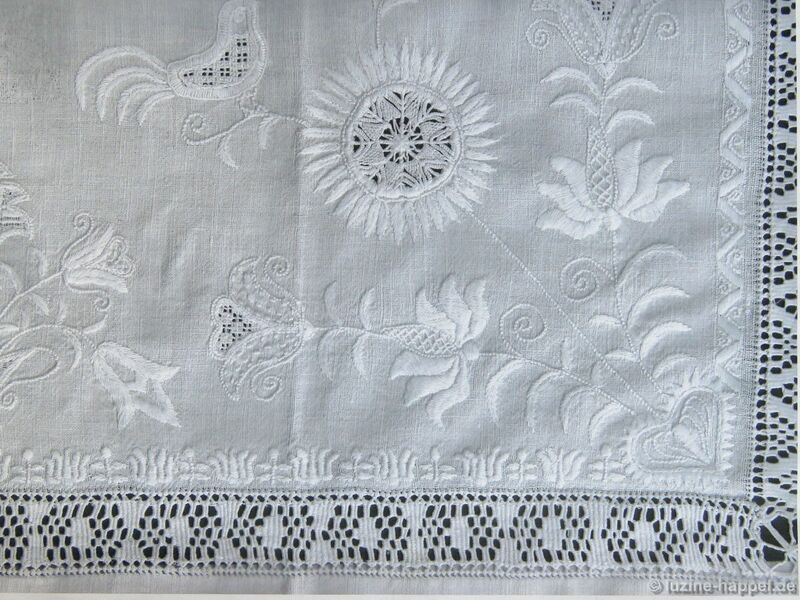 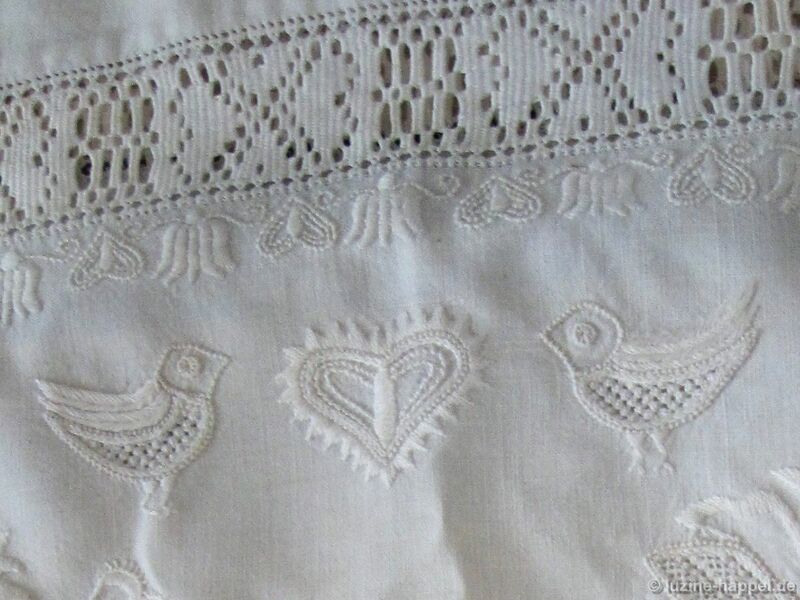 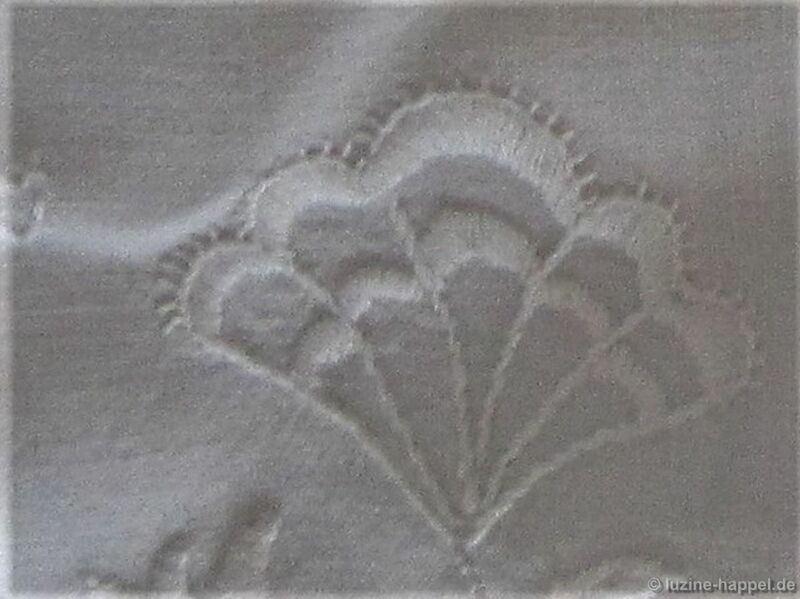 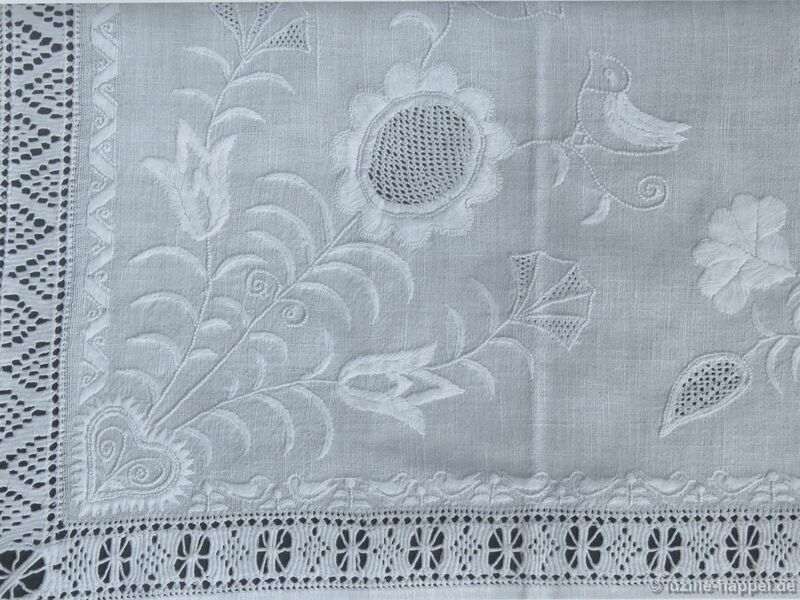 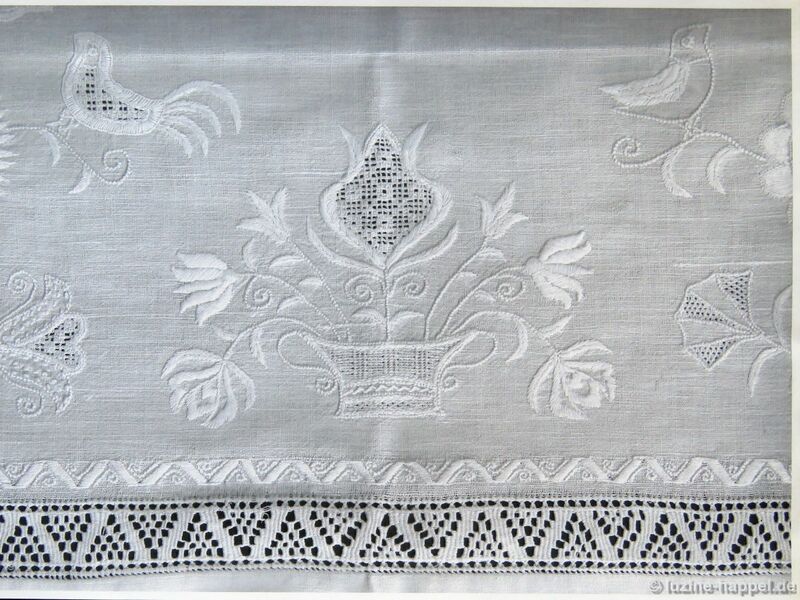 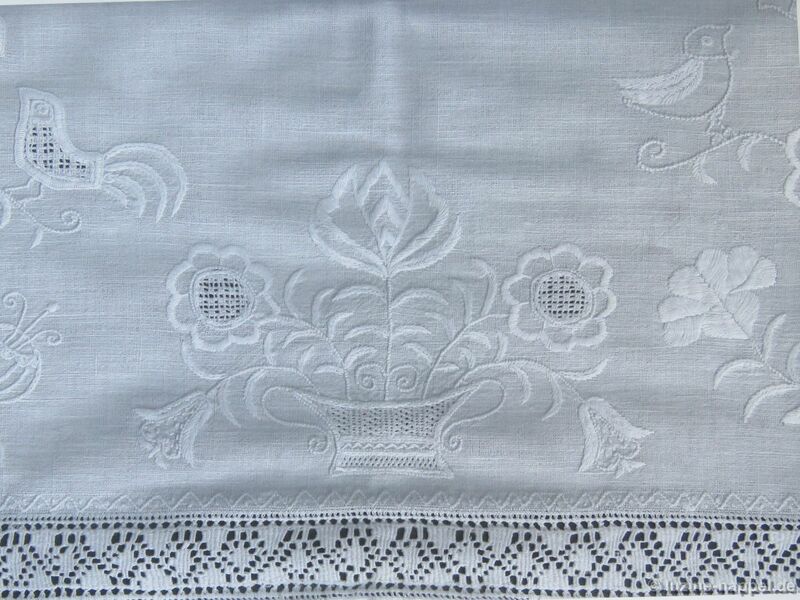 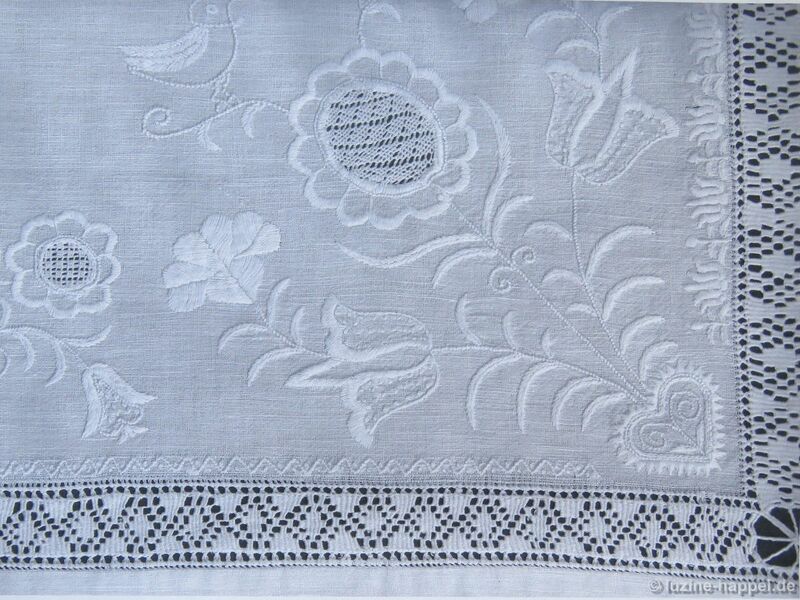 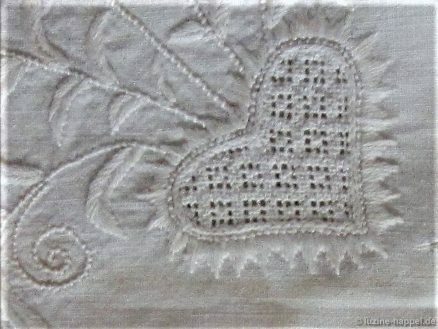 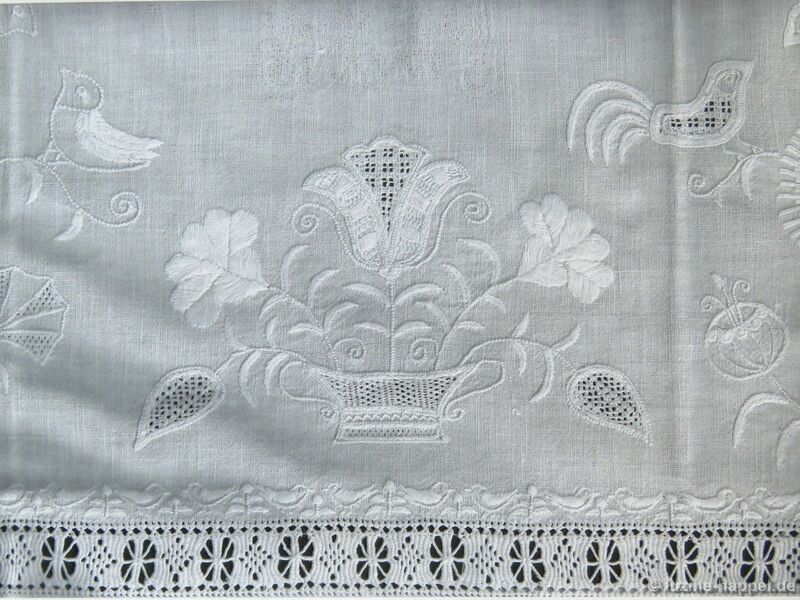 In the 1920s Alexandra Thielmann established a school for Schwalm whitework in Willingshausen. 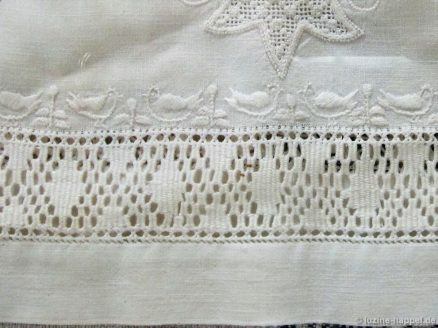 Here older girls and young women learned to embroider the Schwalm technique. 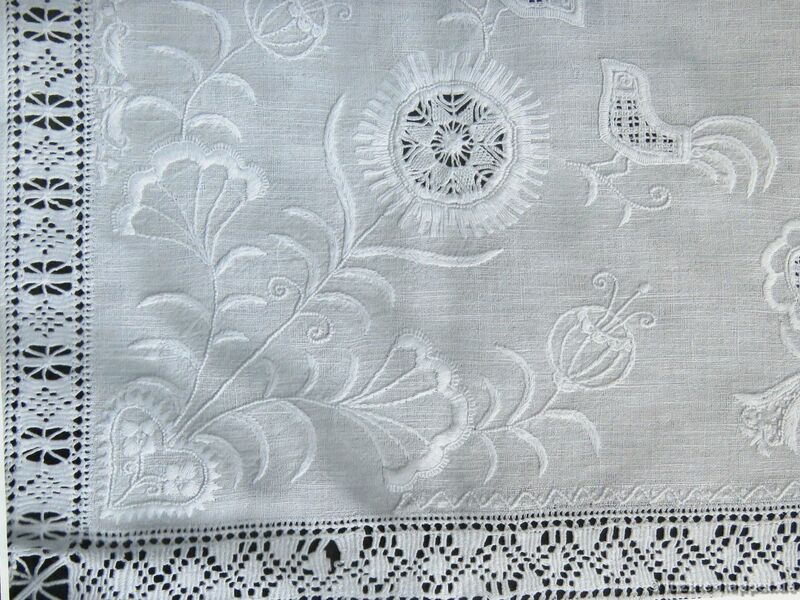 And when they were able to embroider perfectly, they worked elaborate pieces that were sold all over Germany. 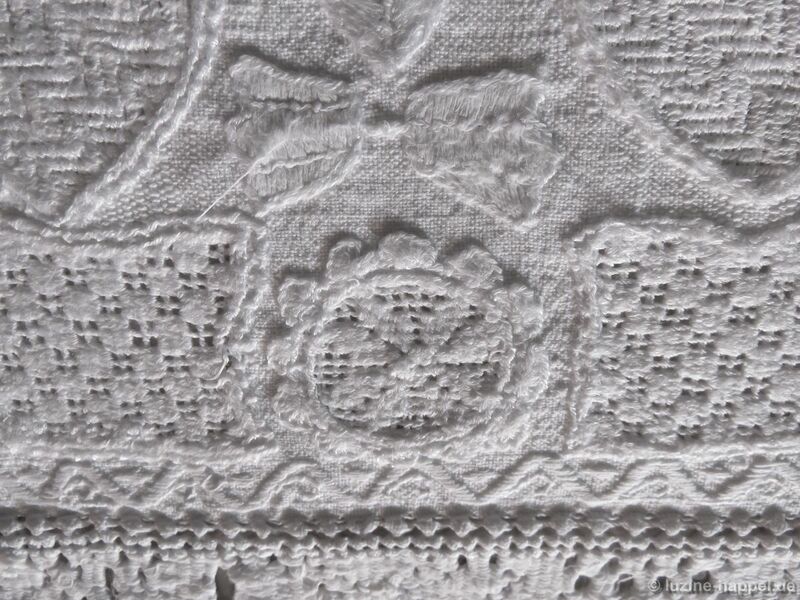 Alexandra Thielmann´s work was characterized by a preponderance of flower motifs including a wide variety of different tulips and other blooms. 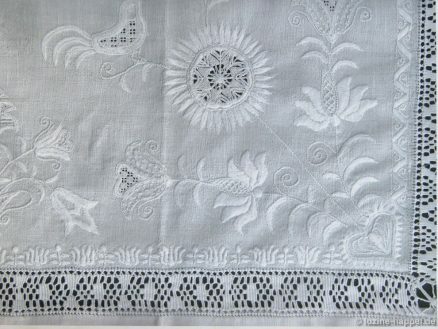 She preferred pointed leaves and combined single leaves with two- or three-piece leaf objects. The students had to work a square sampler cloth first. 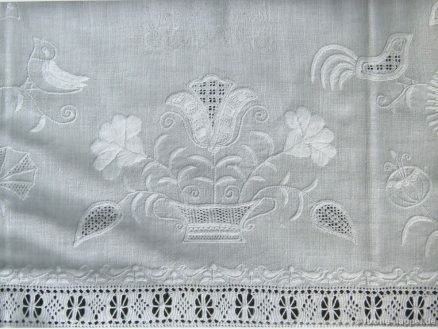 The embroiderer´s skills varied. 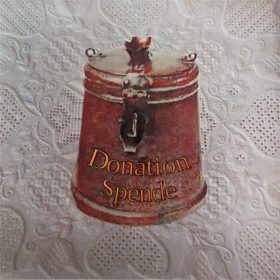 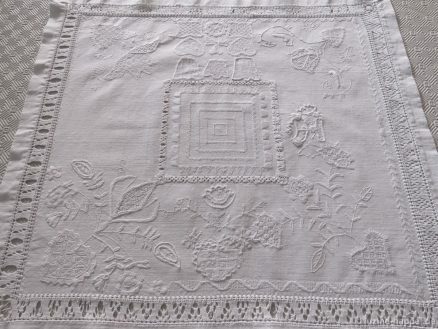 The sampler piece I found is not the most perfect, but one can see the lesson´s contents. 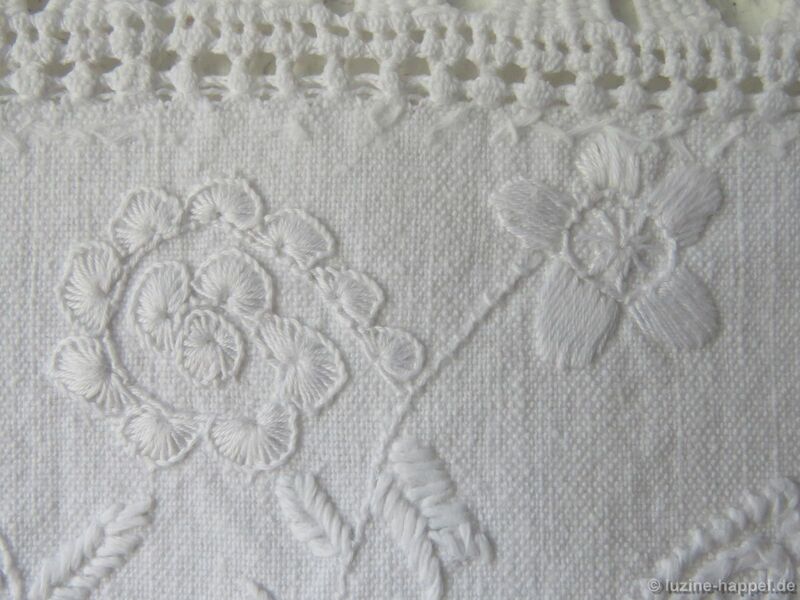 In the center, squares were worked with rows of different scallops and half-eyelet scallops, 2 short-2 long stitches, knife points made with Satin stitches, Blanket stitches, and Blanket stitches worked as pointed half-eyelet scallops, Eyelash stitches, and pointed leaves. 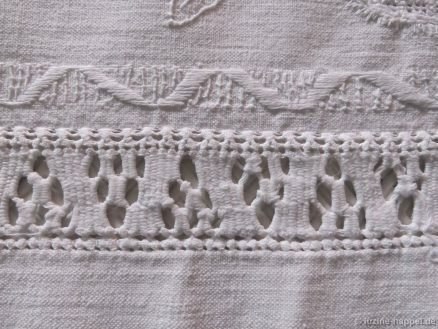 Often four different small needle-weaving bands were added. At the hem Peaholes were worked in combination with four different needle-weaving hems, and there were four different corner arrangements. Beside the hems four different small borders were worked. 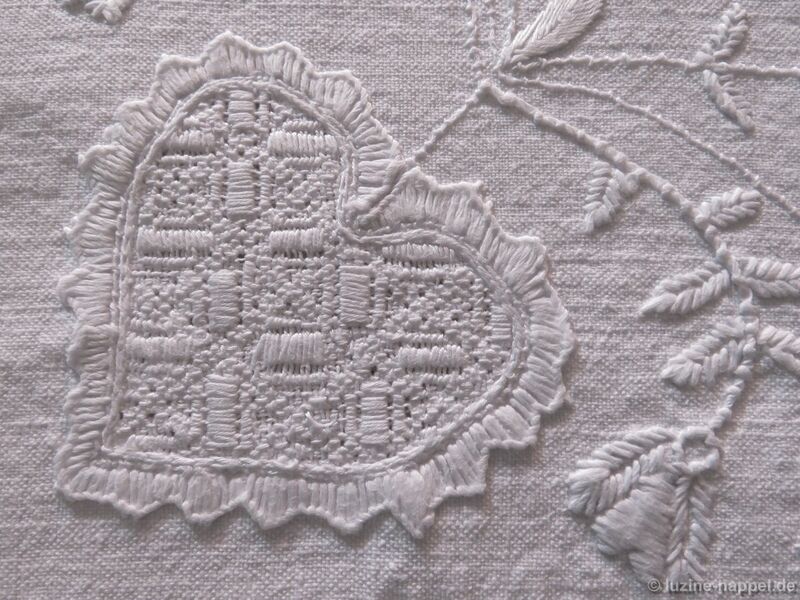 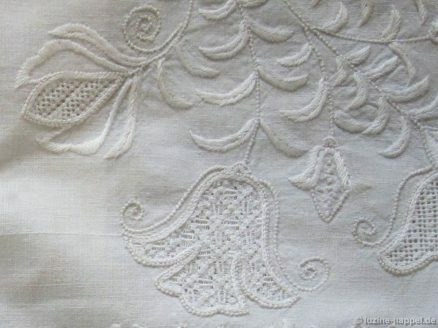 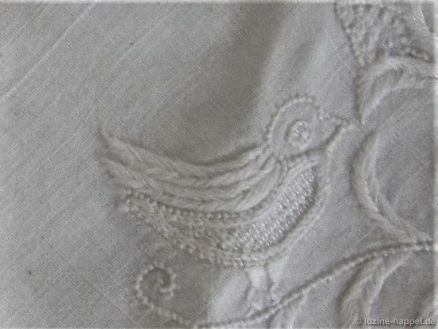 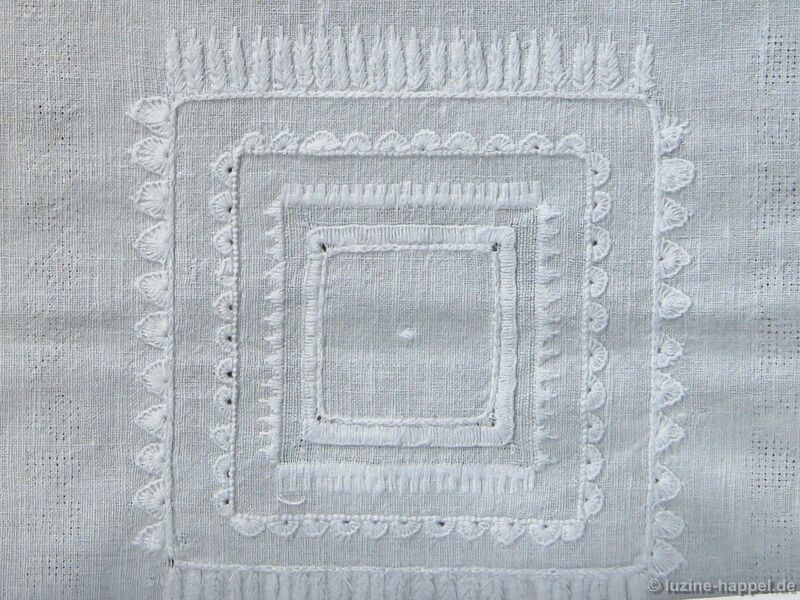 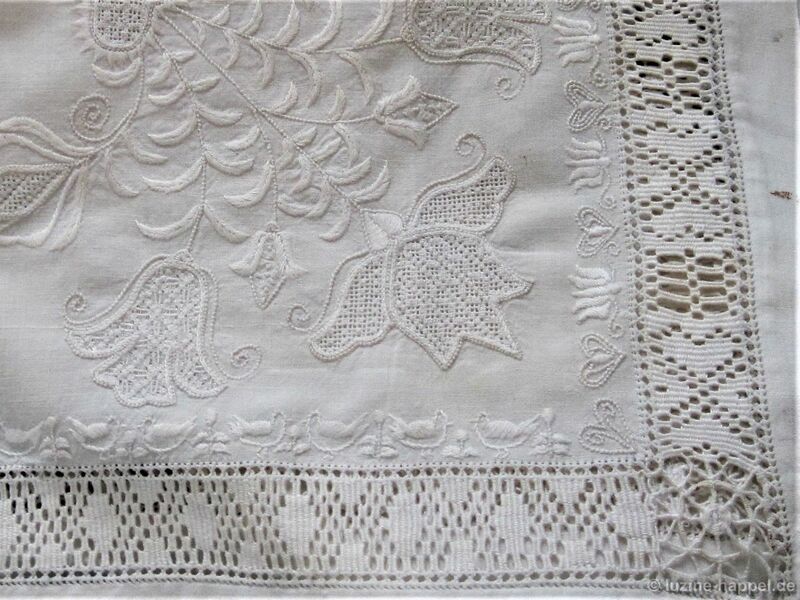 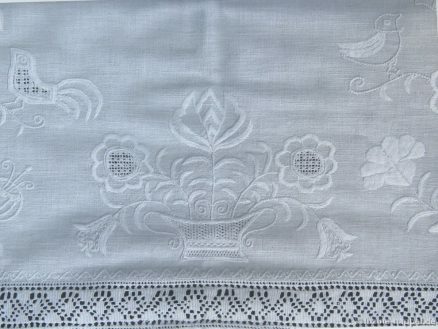 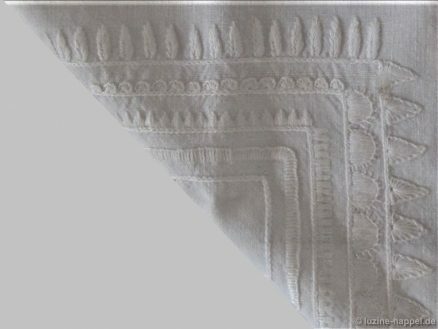 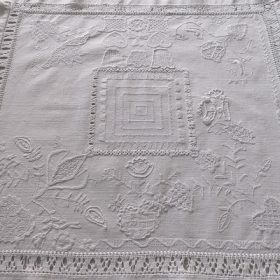 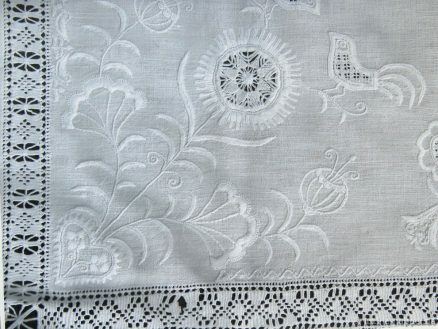 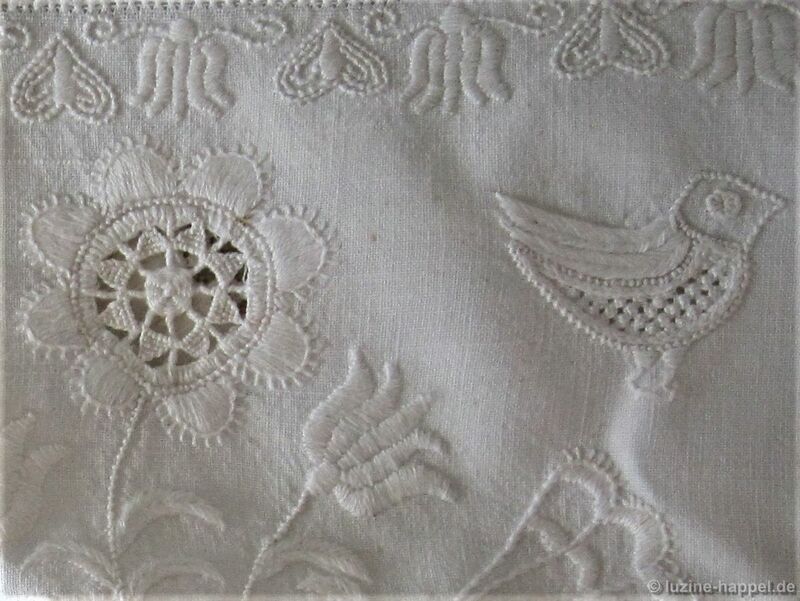 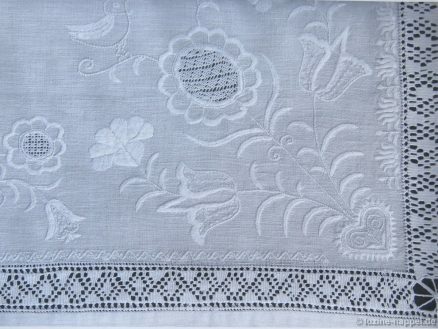 The section between the center squares and the hem was filled with different whitework motifs. The typical Thielmann flowers (such as the tulips and daffodils) and hearts were worked with different outlines. 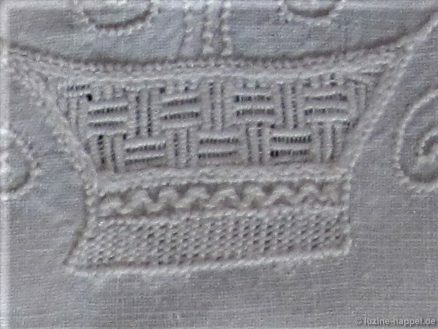 Shapes on the straight of grain and shapes on the bias were embroidered. 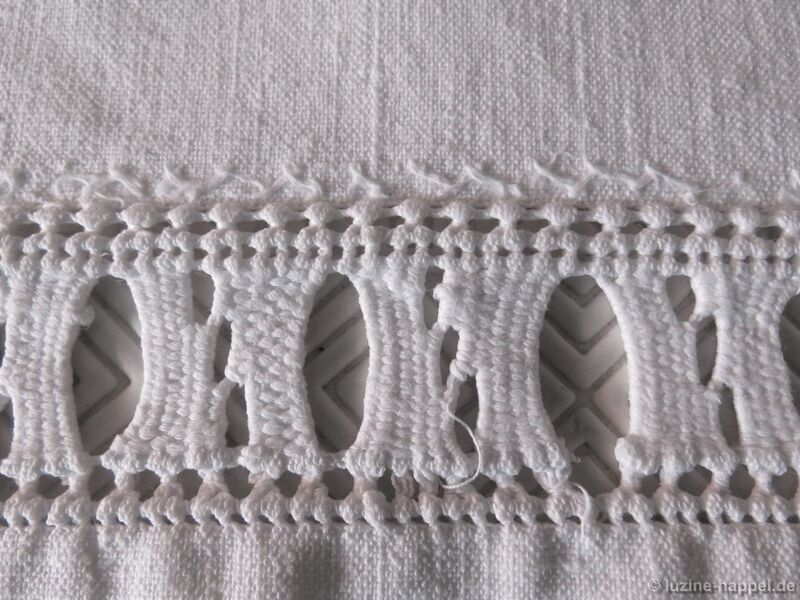 All three types of filling patterns – simple drawn thread, Limet, and openwork – were practiced. 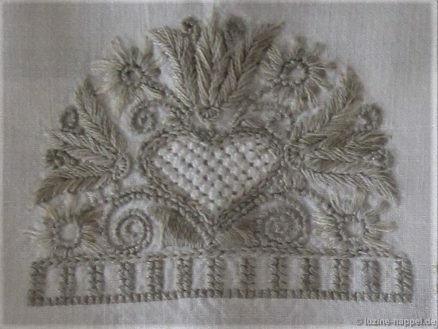 Often a crown was added. 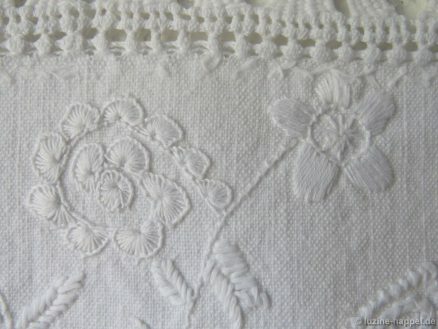 and different small needle-weaving bands were worked in rows to establish squares in the center. At the hem Peaholes were worked on both sides of needle-weaving bands. 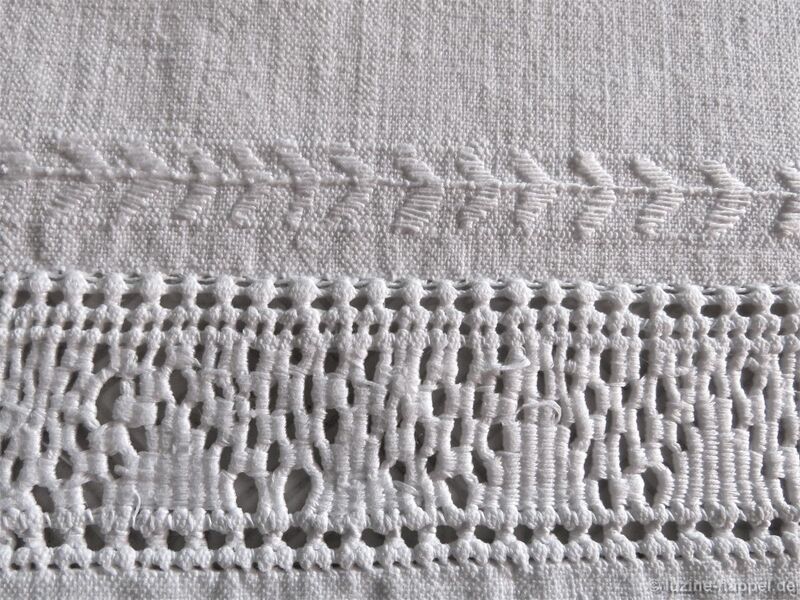 Different small borders are found inwards. 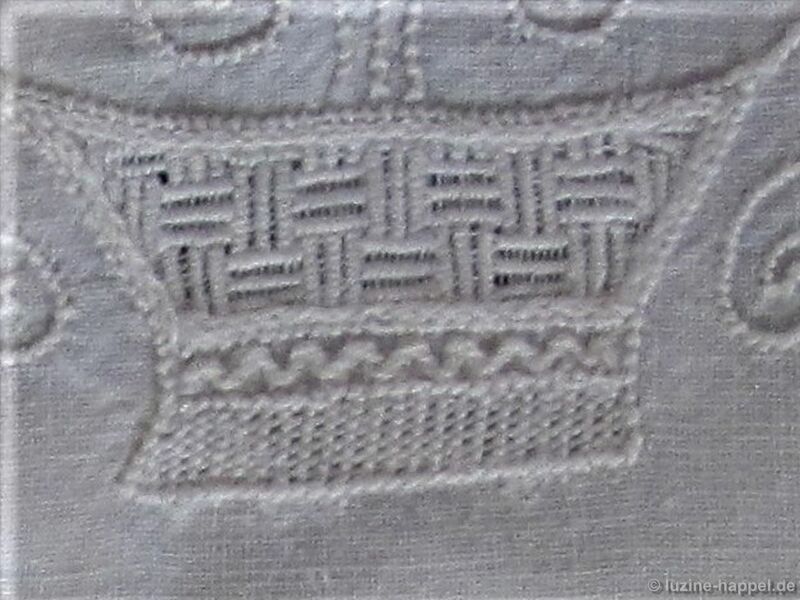 In the above image, Herringbone stitches were added as a small border. 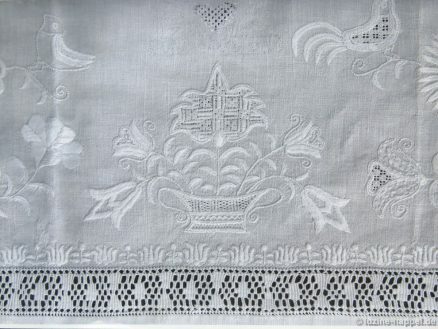 Depending on the skill of the student, additional elaborate motif borders were stitched. 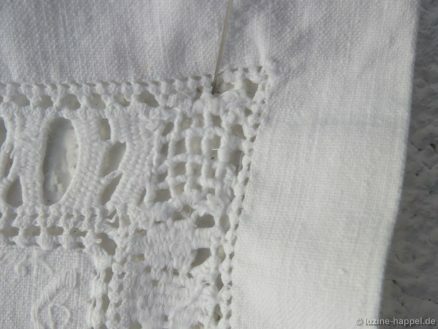 Different corner solutions can be found in my book Fancy Hems. tendrils (made with Blanket stitch half-eyelet scallops) were stitched. Very different flower shapes and circles can also be found. 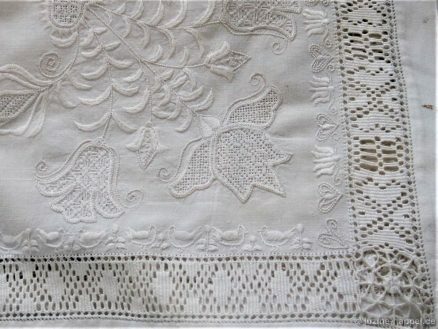 needlelace fillings are also found. 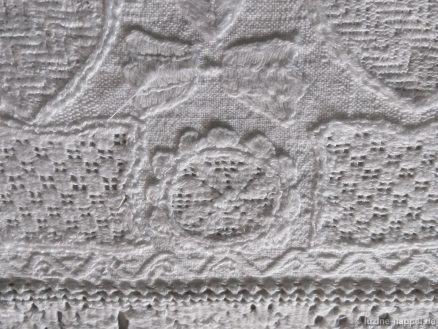 Topping off the work a crown was embroidered. 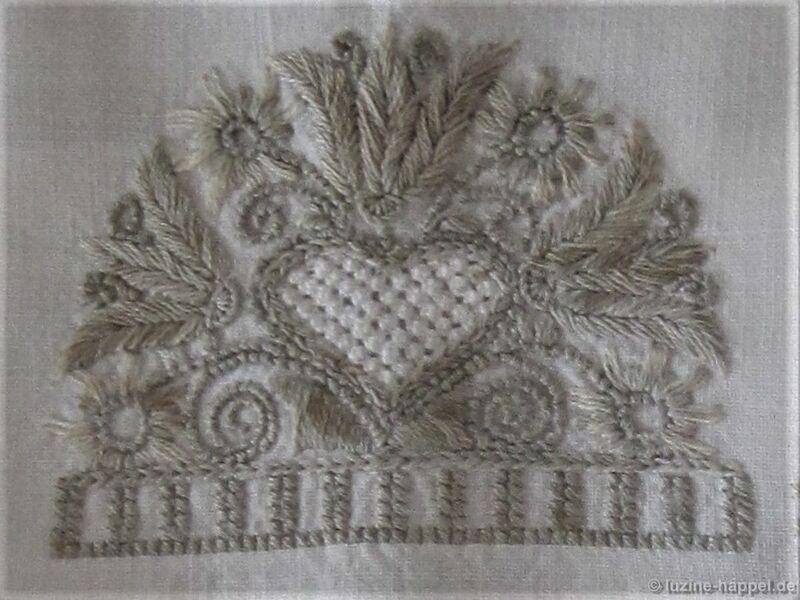 Many different Schwalm crown designs have been published in my books Schwalm Crowns and Grand Schwalm Crowns. 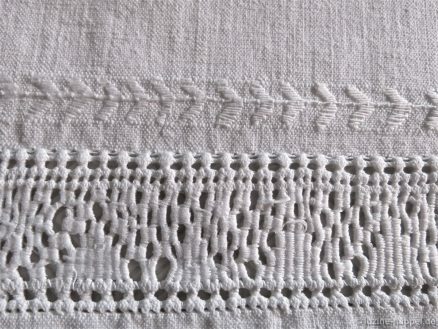 Most of the manifold and richly diverse Schwalm techniques were taught on a single cloth! 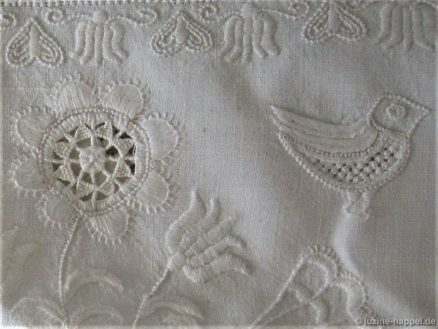 Because pattern books were rare at the time, such a sampler cloth was a great resource for the embroiderer. I just received pictures of another Thielmann practicing cloth. Especially interesting are the few early Schwalm whitework filling patterns. 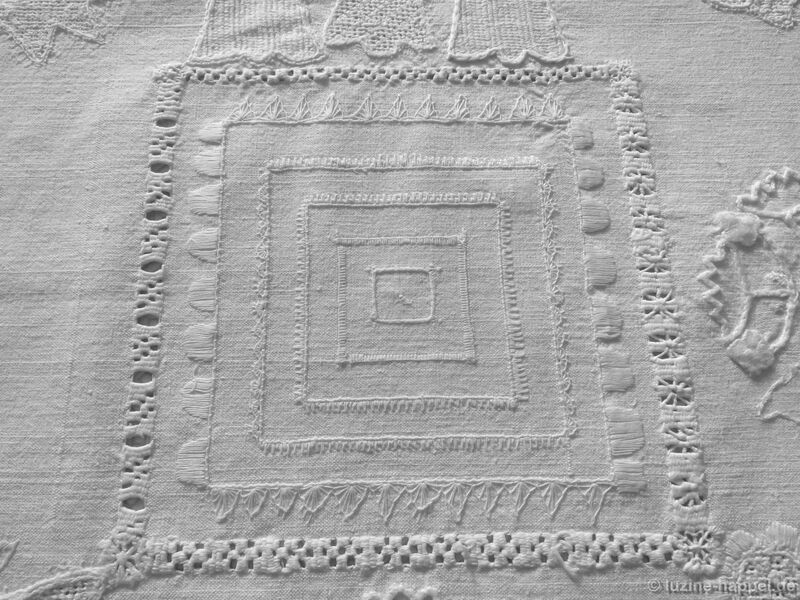 The pictures are of the center square, the four corner designs, and the four middle-section designs.